The start of British Pie Week was celebrated at 00:01 with the official unveiling of the Pierate Logo pie created by “Nice Pie” – which was eaten together by four of the Pierateers when they met at the weekend. Day one of British Pie Week started with a single Mr Kipling apple pie for breakfast, to see in the week and leave maximum pie room for the Double Pie attempt at Canteen. In between these pies, Pierateer RAS had a very enjoyable meet up with Pierateer SJL, Daniel and Matthew – talking pie, blogs and life with them all. Daniel is attempting the same “Pies for every meal” challenge as Pierateer SJL and is keen to get a wide range of pies involved. Matthew is an expert in food geography and his "Food and Geography" blog includes articles on the Melton Mowbray Pork Pie and its protected food name status. When meeting with Matthew he recorded an interview with us, where we talk about the 7 Cs pie rating criteria, our thoughts on pie rating and some of the ways we have used social media to promote pies and Pierate. To listen in visit Matthew's Food and Geography blog here. After a number of interviews, Pierateer RAS set off for his lunch at Canteen. Their Beef and Tomato pie was thoroughly enjoyed with a great score of 5.93/7 and was followed by a very respectable 4.5/7 for their apple pie. The evening was rounded off with a Fuud Chicken and Chestnut pie when he had returned to Birmingham. All this means Pierateer RAS had pie for Breakfast, Lunch and Dinner, meaning he completed Pie-thagoras Theorem on day one of British Pie Week! See the other side of the story. List to Matthew interviewing the Pierateers in 'A Conservation with the Pierateers' on his Food & Geography blog and also Daniel Lynch's interview with the Pierateers. 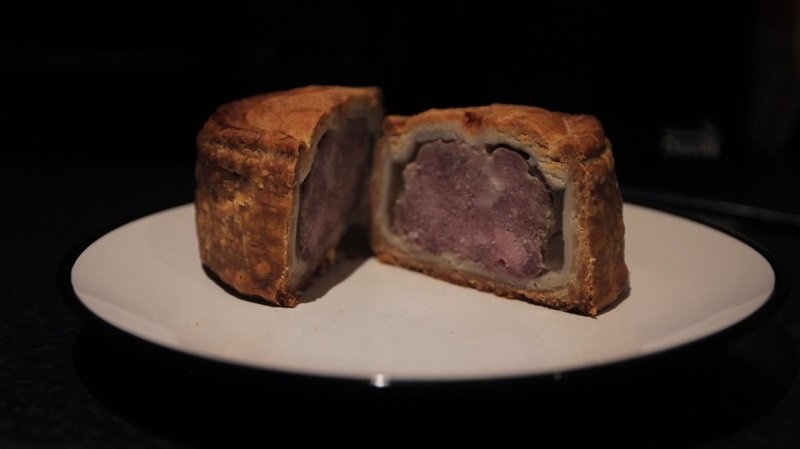 - Pierateer TJP completed the pork pie challenge, eating nothing but pork pies for 24 hours. You can read about his day here. - You can also read about his attendance at the Princess Victoria Pork Pie Off.